Addressing a crowd of 150 people, Chancellor George Blumenthal spoke of inevitable layoffs, the need to raise revenues, and the far-ranging impacts of an ongoing $19 million budget reduction. 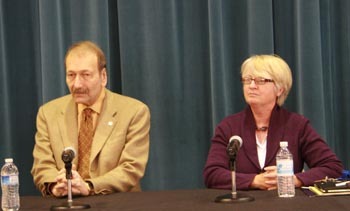 The spring-quarter Staff Advisory Board forum, which drew 150 people to the Stevenson Event Center on April 7, was a chance for Blumenthal and Campus Provost Alison Galloway to answer questions and address concerns about budget impacts. “It’s a tragedy because people are the heart of UC Santa Cruz,” Blumenthal said of an unknown number of layoffs on campus that will occur during the spring quarter. UCSC’s share of an estimated half-billion-dollar University of California systemwide reduction in state support is estimated at $31 million. However, the actual amount that must be cut will be closer to $19 million because of prudent financial actions that the campus took last year, Blumenthal said. Still, the impact will be drastic, he acknowledged. Final decisions about staffing cuts and other budget reductions are expected to be made in May. The campus is closely monitoring the progress of discussions — now stalled — that would extend a temporary increase in income, vehicle and sales taxes to offset budget cuts. Without that extension, the systemwide cuts could be much higher. Blumenthal mentioned the possibility of another half-billion-dollar cut to the entire UC system, and an additional $31 million cut to UCSC if the measure does not pass. Blumenthal said that it would be impossible to make such a cut and maintain educational quality. "I simply don't know how we could serve our students with a cut of that magnitude." Several audience members asked about various ways to raise resources in the face of budget cuts. Blumenthal mentioned the possibility of UCSC increasing the number of students who pay out-of-state-tuition. He also focused on the importance of private fundraising, continuing to court federal research funds, and implementing a long-term vision for UCSC that is less reliant on state support. The presentation was recorded for later viewing. For more information, go to: sab.ucsc.edu/.